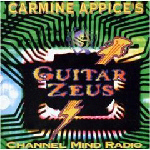 NOTE : Since it's first release (1997), various versions of "Carmine Appice's Guitar Zeus (Volume II)" does exist, but not all features the song "Snake" with Bruce Kulick. Additional fills on "Stash" by John McEnroe. Produced by Carmine Appice and Kelly Keeling for Bianic Music. "GZ Blues" written by: Duncan, Keeling, Franklin, Appice. * Since it's first release (1997), various versions of "Carmine Appice's Guitar Zeus - Volume II" does exist, but not all features the song "Snake" with Bruce Kulick.